In past blogs we’ve discussed the importance of expressing empathy in patient interactions. We provided you with a case study to demonstrate how an empathic communication approach could positively impact challenging patient interventions. Empathy not only conveys understanding and nonjudgment about a patient’s perspective, but also increases mutual trust and collaboration within a healthcare conversation.1 Furthermore, patient-provider interactions that are high in empathy have been correlated with better results and less medical complications than their less empathetic counterparts.2 Research supports that empathy is not just a fleeting, nebulous feeling; when used effectively it actually improves clinical outcomes. Most of us readily agree that empathy is a worthwhile characteristic; however, it can still be challenging to express it during a busy day of brief patient interactions. 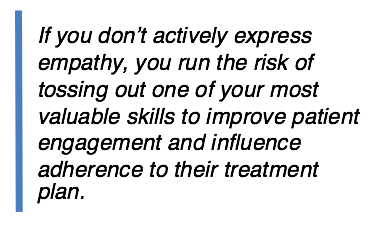 If you don’t actively express empathy, you run the risk of tossing out one of your most valuable skills to improve patient engagement and influence adherence to a treatment plan. To help hone your skills and externalize your empathic perspective, we will explore answers to the following questions: What exactly is empathy? How is it best expressed? What are some good tips for building this skill set? Before we can express empathy, we first need to tap into it. Identifying empathy within ourselves is a matter of taking time to consider the patient’s perspective, situation, feelings, challenges, barriers, and motivators. Sometimes, we realize that we can’t practically do this because we haven’t evoked this information from the patient; instead, we have made assumptions after looking through the lens of our own experiences, biases, and perspective. Therefore, it can be very helpful to consciously bypass the “I think/I feel/I know” in the internal dialogue, take off our “fix-it hat” and, instead, put on our “curiosity hat” to attempt to enter the patient’s worldview. 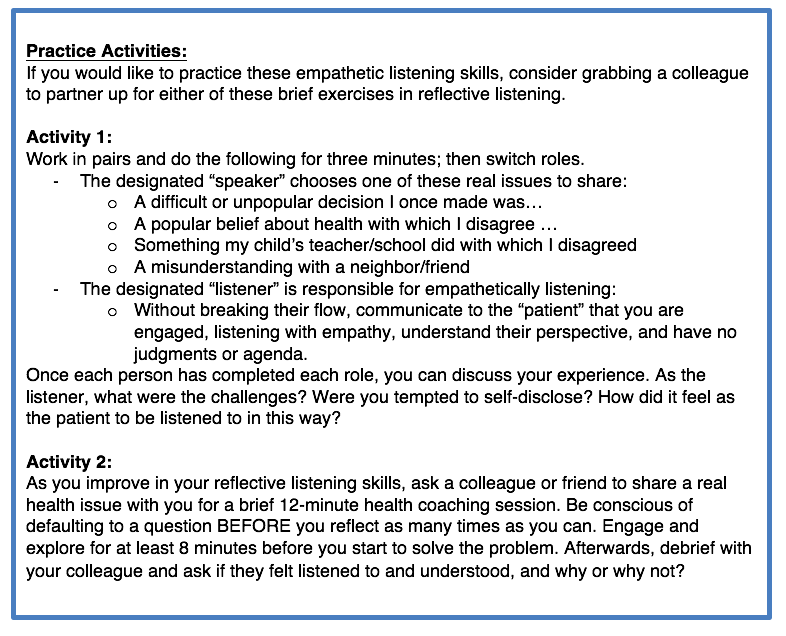 When reflective listening is presented to healthcare providers as an important skill set to learn/practice at a training, it’s normal for participants to experience some discomfort. It can feel as if they are being asked to step outside their clinical role into one that is too “touchy-feely” or that of one akin to a counselor. 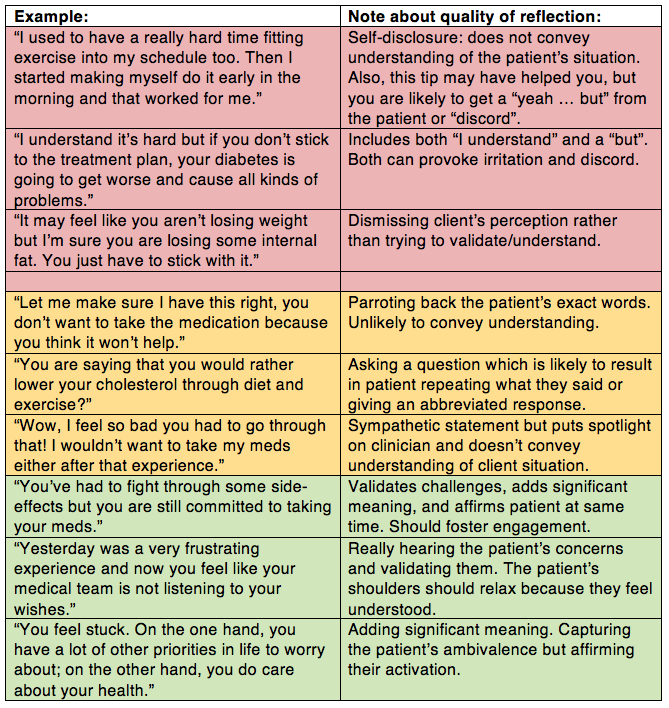 It’s generally reassuring to convey to them that using reflective listening to express empathy and engage with patients in a healthcare setting should not morph into a counseling session. Although effective health coaching rests upon the same rapport-building foundation that a behavioral health specialist creates, one should stay within the boundaries of their role. Stay tuned for more on how to keep this boundary and refer patients to other resources for psychosocial issues that arise during health coaching sessions in a future blog article. Here are some quick tips to practice/improve your reflective listening skills. 1. Be sure your reflection is expressed as a statement instead of a question. If the intonation goes up at the end of a phrase like a question, instead of feeling understood, the patient is likely to repeat what they just said. 2. Instead of repeating back the exact words of the patient, try to reflect back the meaning or feeling that was inherent in what the patient shared with you. 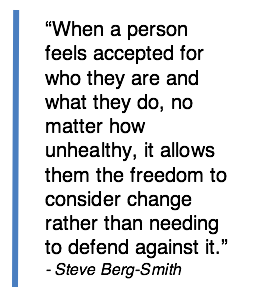 In this way, the they feel understood at a deeper level. 3. If you are having trouble coming up with reflections, try thinking or saying phrases to get you started such as: “You are wondering if …”, “You are feeling …”, “It sounds like …”, or “It seems as if …”. 4. Be sure that your reflections are genuine. If you haven’t gotten a sense yet of what your patient is trying to convey, you are better off continuing to explore with questions. 5. As you improve, you can make your reflections shorter to make them have more “punch” by leaving off extraneous information at the beginning and end. In addition, consider the following checklist to check the quality of your reflections. 1. Avoid self-disclosure or putting the spotlight on you; there’s a time and place for it, but it does not convey empathy or understanding through the patient’s experiences. 2. Avoid “parroting” back what the patient said or repeating the same phrase over and over (e.g., “If I understand you correctly, what you are saying is …”). Both can be annoying. 3. Avoid putting a “but” after your reflection as it negates it, and it is generally your agenda taking over rather than an attempt to understand. 4. Avoid judgment or sarcasm. ​​5. Avoid saying “I understand”. It doesn't convey understanding, and can elicit irritation or pushback from the patient. It may be helpful to see some examples with comments about what makes the reflections effective or not. The statements in the red boxes have the potential to harm rapport; the ones in orange boxes may not cause harm, but aren’t very effective; the ones in green should convey understanding and improve engagement. When a patient feels understood, they feel more accepted and less judged. This leads to better engagement and rapport; thus, your patients are more likely to be open to your recommendations as you improve this skill set. Like your other clinical skills, becoming adept at reflective listening and expressing empathy takes practice. With these tips and examples, we hope you feel prepared to flex your empathetic side in your next patient interactions. 1. Kim SS. The Effects of Physician Empathy on Patient Satisfaction and Compliance. Eval Health Prof 2004 Jan;27(3):237–51. 2. Del Canale S, Louis DZ, Maio V, et al. The relationship between physician empathy and disease complications: an empirical study of primary care physicians and their diabetic patients in Parma, Italy. Acad Med 2012;87(9):1243-9. 3. Miller WR, Rollnick S. Motivational Interviewing: Helping People Change. Third Edition. New York: Guilford Press, 2013. 4. Jackson C, Butterworth S, Hall A, Gilbert J. Motivational Interviewing Competency Assessment (MICA). 2015. Unpublished manual. 5. Moyers TB, Miller WR. Is Low Therapist Empathy Toxic? Psych Addic Behav 2013;27(3):878-884.